Replacement: None. We are no longer carrying this module, but we still have a selection of Nordic transceivers. This page is for reference only. 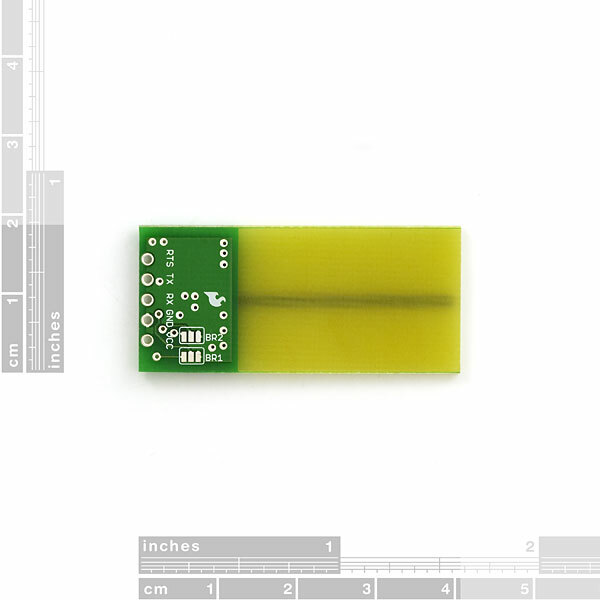 This is a breakout board for the Nordic nRF24AP1. 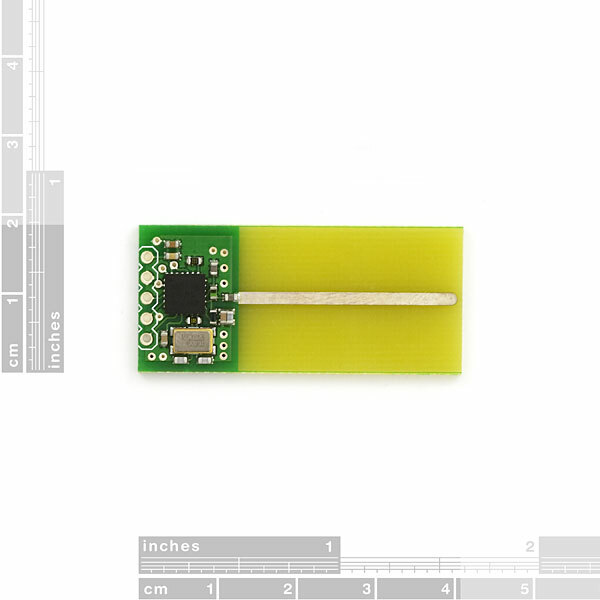 This transceiver IC is capable of talking to various wireless products that utilize the ANT protocol such as heart rate straps, bicycle computers, tachometers, and more! The nRF24AP1 is a combination of the nRF2401A with a masked in protocol called 'ANT' and a simple to use serial interface. The nRF24AP1 breakout board can be configured to operate at different baud rates by closing two solder jumpers. The board is shipped with settings for 4800bps. This device cannot communicate with Polar Heart Rate products. This device uses a digital signal, where the Polar system uses a low-frequency EMF signal. The nRF24AP1 is compatible with modern Garmin and Sunnto products that use the ANT protocol. Hi all. The lack of this product is going to make it difficult for hobbyists who wish to communicate using the ANT+ protocol. There is an alternative, but it requires more work. ANTAP281M4IB and ANTAP281M5IB Modules are FCC and CE compliant but require a little more work to connect. They have SMD? style board mounts. I've recently had to switch back to the ANTAP281M4IB module hand soldered wires from the surface mounts to protoboard. It works as a drop in replacement for this if you tie certain pins high and low. I'll be putting something on my blog tonight or tomorrow. I actually have some of these sitting on my desk, I just need some time to mess with them. I think they are the nRF24AP2 IC though. And I didn't realize there was a module with F antenna, like the one you are suggesting. I'll have to check that out. Thanks for the comment! What is the difference of this product to the nRF24L01 when communicating with HRM devices? Has anyone tried it with a PIC microcontroller? 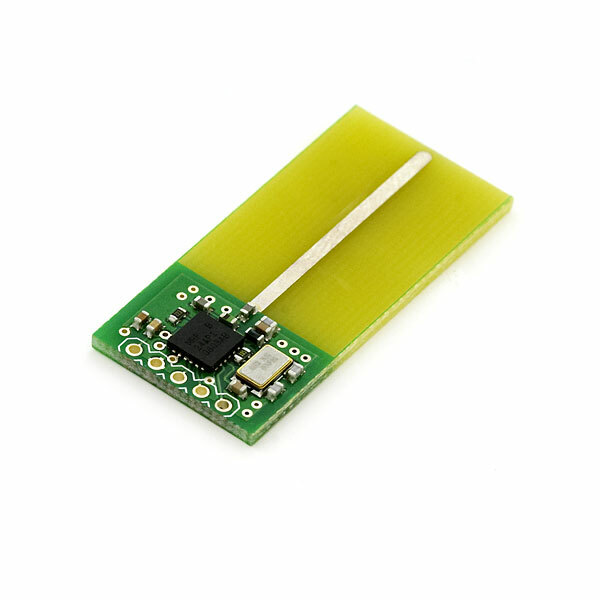 Any chances for same board, but with new nRF24AP2-8CH? I spent a while pounding at this, so I mainly am posting this here to encourage others that it is possible. There is a project here: http://chomsky.shampoo.ca/goldenembed that uses this board to talk to various ANT+ hardware devices. All GPL'd. I was looking at the data sheet and noticed that to get a baud rate of 9600 one would three BR pins (BR1, BR2, and BR3). The back of the board only has BR1 and BR2, can it not be configured to a 9600 baud rate. For that module you can do 19200, but not 9600. I put together an example for how to utilize this transceiver from an MSP430. It's the functional equivalent of the AVR code posted above. The nRF24AP1 is compatible with modern Garmin and Sunnto products that use the ANT protocol. I can't speak for Garmin, but this isn't true for Suunto. Yes this device speaks ANT so is technically compatible, but I'm told by a technical contact within the ANT+ alliance that Suunto use private network keys and proprietary device profiles which mean you can't just plug it in an expect it to work. I'll contact Suunto and see what's involved here (as I already have a developer account with them) but if they won't give up the goods this is pretty much a $25 ornament. Now that I've got my hissy fit out of the way, if anyone has gone down this route with Suunto in the past, or believes that you can pair this with a Suunto HRM successfully, I'd welcome any pointers. Thanks for the follow-up! So what kind of range are you talking about? 10/30/100ft? Is that line of sight, inside a building, etc? I'd like to know how suitable this chipset and antenna would be for some home automation scenarios. I'm about to order the USB stick so a test app would be great. Mind sending me an email, brett at hackleman.net? Anyone have some rough range numbers for this device? Thanks.